We’ve kicked off our 2010 events in style! Check out the fabulous review of the show by Chris Mann from the Los Angeles Times by clicking HERE! This entry was posted on February 17, 2010 at 10:03 pm and is filed under Uncategorized. You can follow any responses to this entry through the RSS 2.0 feed. You can leave a response, or trackback from your own site. This was great show. Well run. I want to thank the promoters of the Hollywood Show for doing this and making these celebrities available. I have been going for years and it keeps getting better. The line for The Terminator celebs moved slowly but boy was it worth the wait. They all chatted and joked with us. Took pictures and were genuinely happy to be there. Fantastic!! I went to the show on valentines day with my girl and it was great, 1st time I’ve been to one of these and I was thrilled to see all the stars especially West Side Story crew, I’ve been a fan of this movie and the actors and actresses for years, they were all so nice, George was talking to me as if he knew me for years… What a thrill, also Stefanie Powers was really nice and still great looking as was Lee Meriwether, and Lindsay Wagner, etc… Can’t wait for next one, loved it. I met Corey Feldman for a 2nd time and it was my brother’s and sister-in-law’s fiorst time. Corey’s a really nice guy…so down to earth and still HOT! allowed us to take free pics with him….He always does. The only reason I found out about the Hollywood Show is because Corey posted it on his website…The show isn’t advertised too good otherwise…which is both bad and good for us fans. Didn’t really like Corey’s booth because he was blocked in on both sides by a curtain.Don’t think he liked that either! Read show will be better from now on with less curtians blocking the celebs. *Hugh O’Brian is a wild man! THAT”S MY ARM with him in the LA TIMES!!! A reporter called me over to test my celeb lnowledge and chat. 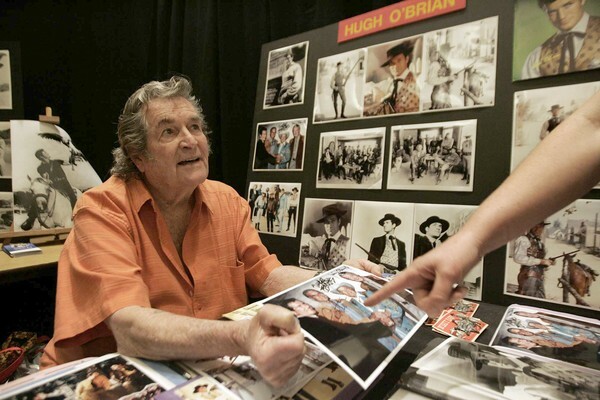 Hugh O’brian’s wife was a sweetheart…she gave me a free autogaphed pic of him. I’m sure I’ll be attending the show in the future. Thanks!